benzene: in plastics, synthetic fibers, lubricants, rubber, pesticides, and more. I have a few of the aforementioned… but I am going out to get a few more. Thanks Kim for this luvly and informative post! I’ve never thought of bringing Gerbers into the house. What a great idea. Mine grow in our flower bed all year long. I need to do more houseplants in my home Kim. The palm looks so pretty behind that chair and I just love the peace lilly. I use to have several of the “mother-in-law” tongues (not sure what its called) but I killed them.. I think I’m gonna try the palm like yours! Thanks so much girl for sharing! big hugs! Those are also called snake plants. I absolutely love those. I think I’ll have to invest in a couple majesty palms – they’d go perfectly in our living room! I also want to start some succulents in terrariums. With all the wood furniture and wood projects in our house, we need a touch of green! Be aware when you have house plants…make sure they are safe enough and out of the way for pets and small children. There is a reason the “Dumb Cane” (Dieffenbachia) is called a “Dumb Cane”. The white powder on the leaves and stems makes the tongue swell when it comes in contact with the mouth and possibly will adversely affect the eyes, etc. Many houseplants are poisonous/dangerous to children(and adults) and pets. 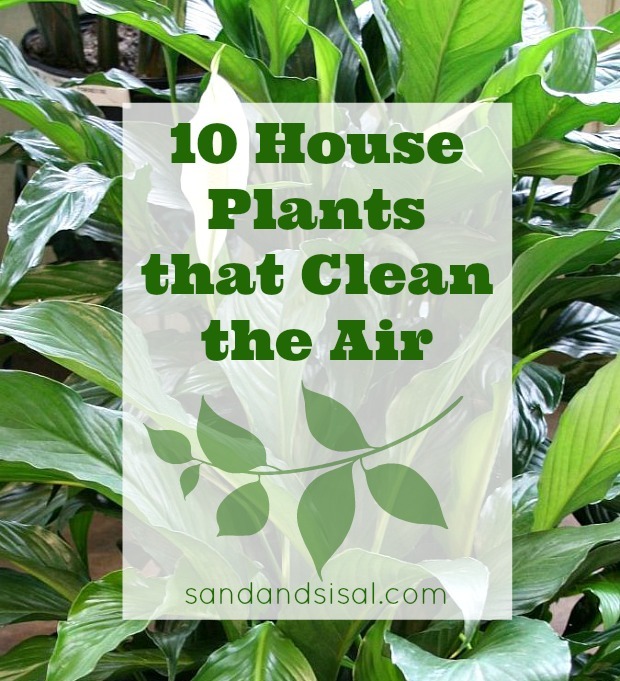 Plants in general clean our air—indoors and outdoors. Just know what you have in your home and yard. I already have 2 of these because I love the look, but didn’t realize how they were helping clean the air in my home. Bonus!